Comments: These are one of my best sellers, and have become kind of my "signature" at craft sales. They are absolutely adorable, and everybody loves them. More importantly, I've been doing them for years and years now, and I still love them! 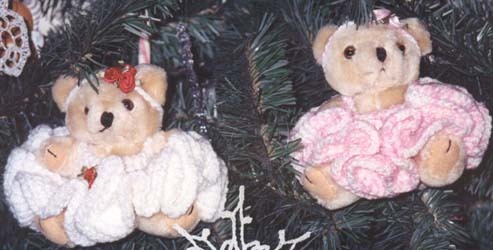 They are purchased bears with crocheted dresses. In stock: White (large and small pictures), pink (small picture, back row), pink/white (large and small pictures), pink w/ white edging (small picture), yellow w/ white edging (small picture), green (small picture). Colors: Assorted. White, pink, violet, blue, yellow, green, variegated. E-mail me with your color preferences. Way too many to photograph them all! Shown: Large photo: White and pink/white. Small photo: Green, pink/white, white, pink (back), pink w/white, white, yellow w/white. To order: Reference item by above-listed color combination. Shipping: $2 for one bear, $1 for each additional bear shipped at the same time.